Just prior to taking in a SXSW screening of the original Godzilla with a special clip from this year's 2014 reboot, Shock reconnected with director Gareth Edwards to talk a bit more about his highly-anticipated film. This isn't the first time we've chatted all things Godzilla with the director of Monsters. It's more like our fourth or fifth conversation, including the chats we had last year on set (look for that report next week) and the one that took place at Comic-Con. Each time we run into Edwards, we get him to open up more and more about this project which has maintained a fair amount of secrecy… until the trailers hit and the magazine covers were revealed and the toys started to get leaked. These debuts have helped paved the way for our most recent interview in which I talk with Edwards at SXSW about Godzilla's design and how nature, as well as a Jim Henson production, inspired the monster's new look. We also turn to topics like what "the Internet" sees in the trailer, the importance of the 1954 film and Closer Encounters of the Third Kind's impact on Edward's movie. To read our footage description, click here. Gareth Edwards: It's funny you mention his legs because – being English, you learn a lot of American terms that I don't know – one of the ones I learned was "cankles." I've heard Godzilla has some really good cankles going on. [laughs] Weta Workshop worked on the design of Godzilla a lot. This was really early on in the process while we were working on the screenplay. What was great is I could see their desktop on my computer and I could see a 3D model of Godzilla and they would slowly rotate it. Our goal would be to rotate the model and change anything that doesn't look right and keep changing it until we could rotate it 360-degrees and not have any criticism. That took months. I thought it was going to be an easy job, but they did over 100 designs. When we were experimenting with the process, you're trying to put out wacky thoughts and ideas and even if you throw out just one percent of a new direction that steers the design in a new way, it helps out. We said, let's take what we have right now and see the "bear version" of that, the "dog version," the "lizard version" and the "dragon version." The face would change a little bit and it would be very much like an evolution. We kept trying generation after generation until we landed where we did. Turek: And what about his face? Turek: The trailer has had an amazing reaction on the Internet. So, let's address Easter Eggs. Many are saying you can spy the Mothra twins in a shot of destroyed buildings. True? Edwards: That's a great example of… you do something and the fans latch onto it. We can't help [looking at it]. There are crazy busy days for us [working on the movie] and when you get a 30-second gap, I’ll look online and these crazy things turn up. And you show them to everyone working in the room and you go, “Look what they’re saying!” [The Mothra spotting] got a laugh. I'd like to say I thought of that and that's what's going on. But when you see the film, you'll understand who those two people are, but they're not there by accident. There's a shot that precedes it that explains it. Turek: Also, they're way too big. Turek: You're giving a presentation of the 2014 film following a screening of the '54 film. Can you talk about the original's importance to you? Edwards: I think it's really underrated and Godzilla is misunderstood in terms of how it all began. People think of Godzilla and think of child-friendly versions. It's funny because people look at the '60s films, they're a bit B-movies and people can say, what if you made it serious like the Batman series became? And if you look at the original, they did that already. They beat us to it by 60 years, it's really serious and somber and very harrowing. Apart from the fact there's a giant monster, I challenge you to show me a film – like a popcorn movie – where they show a child and they hold a Geiger counter and it clicks as if the child is going to die of radiation sickness and the shot moves on. I have not seen that in films of real dramatic weight, let alone a monster movie. I can't think of a more serious monster movie. Edwards: I think the fun, for me, is in the rollercoaster ride of being scared. I know there's a lot of opportunity for comedy in these movies and I wanted to take it seriously, but there are laughs. What's important to me is the difference between the people in that world laughing at the events versus the people in that world taking it very seriously and the audience laughing at the filmmaking. There are ways of doing little shots and audio gags that make you laugh, but the people experiencing that would not be laughing at that. It's fun in the kind of way that it's not goofy or silly. You just have the opportunity for doing something epic and I love the word epic when you talk about movies. 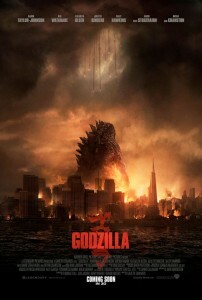 That's what cinema is great at: Giving you goosebumps and I definitely want to do that with a Godzilla film. Edwards: I think that movie is a perfect example of the film I love. Close Encounters was referenced a lot on this, because we have a conspiracy thread in our movie and they get it right. That movie is a great example of doing it right and not putting one foot into cheese. Close Encounters, I think, is one of the best movies ever made and has influenced me as a filmmaker. I think when you see it, I never claimed to make a movie as good as Spielberg ever did, but Close Encounters has infected Godzilla quite a bit.